Located on the popular Siam Country Club Road is the village of SP. 2. 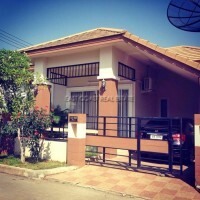 This is one of the best, mature villages in East Pattaya. This bungalow has 4 bedrooms, 3 bathrooms, a European kitchen, a Thai kitchen, 2 living areas, 2 dining areas and a covered utility area. It has full A/C, full furniture and is sold as seen in the pictures with all electrical goods as well. The village itself has a swimming pool, gym, sauna, childrens playpark and 24 hour security. The home is held in a company name so no costs to the buyer as this will be given free of charge by the seller. Owner finance and long term rentals will also be considered.